This is the 12th Mardi Gras season I have been fortunate enough to attend. We’ve located all over the city trying to find the perfect spot to enjoy the parades and people watching. We’ve been in City Park, on Carrollton Avenue, spent a couple of years on St. Charles, until we decided staying right on Canal Street was the best for us. I have dragged everything with me including the kitchen sink,to spend the day cooking and trying to get beads, with an entire group of my extended family surrounding us. We’ve spent a season or two wrapped in blankets, just trying to keep warm, other times in rain gear, because the weather doesn’t always cooperate. But this one, this year, I didn’t even bring an extra bag for the coveted beads we might catch and just let the day roll as it would. We arrived early, as usual, and found a great parking spot. Wandering around the French Quarter, deciding on where to eat was an adventure in itself. It was easy enough to make our way to Canal Street and watch the first parade passing through. Afterwards, the French Quarter again held our fare as we watched a couple of bands and waited for the next parade to roll through. We met up with some friends, still not difficult considering the huge amount of pedestrian traffic walking the closed off streets. The Krewe of Endymion did not fail us as they tossed throws from their beautiful lighted floats, always the highlight of my Mardi Gras. 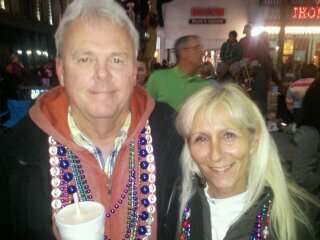 Finally, we headed into the French Quarter again to watch the revellers have a good time. Making our way home, traffic obliged by being light enough for us to pass through without incident. It was a perfect day with the best of friends. This entry was tagged beads, canal street, french quarter, mardi gras, mardi gras season, parades, perfect day. Bookmark the permalink.